The conventional wisdom on developing a quarterback is that it’s best to stash the guy for a while, sit him for a few years behind a veteran and then hand over the keys when he’s more physically, mentally, and emotionally prepared. The Broncos looked like they played it to perfection, drafting Brock Osweiler and riding Peyton Manning until his very last ounce of effectiveness. Except Manning was better for longer than anyone expected, and it’s entirely possible the Broncos could go from a quarterback controversy to not having either. After Manning signed with Denver following his neck surgeries, it required a ton of optimism to think he’d play four more years. That summer the Broncos drafted Osweiler as both insurance and an investment, certainly never believing he’d ride the pine for the duration of his rookie contract. But here we are, and Osweiler’s an unrestricted free agent, and the Broncos, who don’t quite know exactly what they have in the 25-year-old signal-caller, are faced with the choice of paying handsomely for an unknown quantity—or losing him and having to start over with someone else. 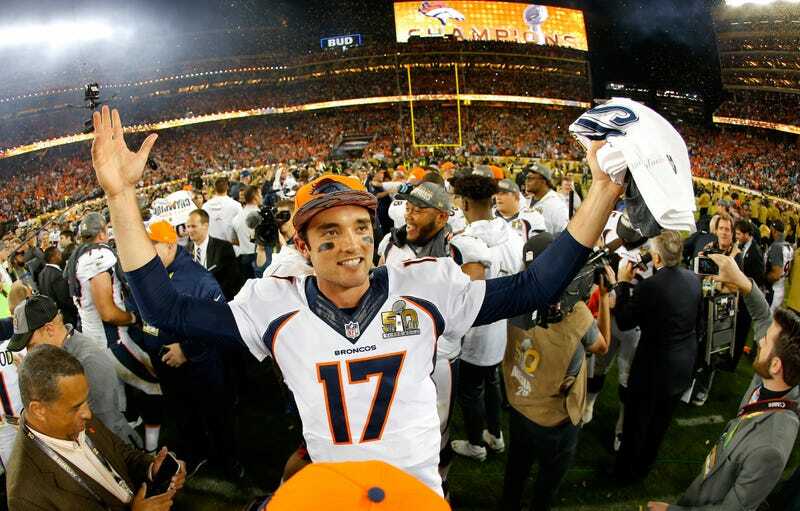 KUSA in Denver reports the Broncos have offered Osweiler a three-year deal worth more than $45 million, but those numbers mean nothing without knowing how much of that is guaranteed and how much of it requires Osweiler to hit certain incentives. You’d assume “not much” and “a lot,” respectively—the Broncos don’t want to commit too much money or too many years to a guy they’re not even sure is good. If they don’t, someone else will. The Houston Texans are reportedly ready to make Osweiler an offer when free agency negotiations officially open today. Of course, the Texans are interested in literally every warm body at quarterback, because it’s been many years since they had better than a cold body back there. But after years of trying to lure Peyton Manning to Houston, this might be a poetic transaction. But no one knows quite what Osweiler has to offer. In his four years he started just seven games, all of them during Manning’s medical absence this season. Osweiler went 5-2, but was increasingly ineffective, finally ceding the job back to Manning. That’s how it’s supposed to work, but ideally, teams get to see a little more than Denver did before deciding whether to commit to the young guy. The Broncos got more than they could have hoped for from Manning’s late-career run, culminating in a championship, but the timing has the potential to backfire.